Rachel loved her weekend mornings at Riding High Farm. The funds from Scatter Sunshine’s first fundraiser was used to update the Family Room to make a comfortable place for families to relax while their children had their lessons. An incredible mural was painted by Ray Mendez, which included Rachel’s favorite horse, Angel. Julian Craig donated his time to install green flooring to represent a pasture. There were eleven clouds painted around the room to represent each of the eleven years Rachel spent on earth. There is a butterfly to symbolize Rachel’s grandmothers who went to heaven before she did. There is a purple flower because Rachel loved all things purple. Scatter Sunshine had a dedication ceremony at the farm. 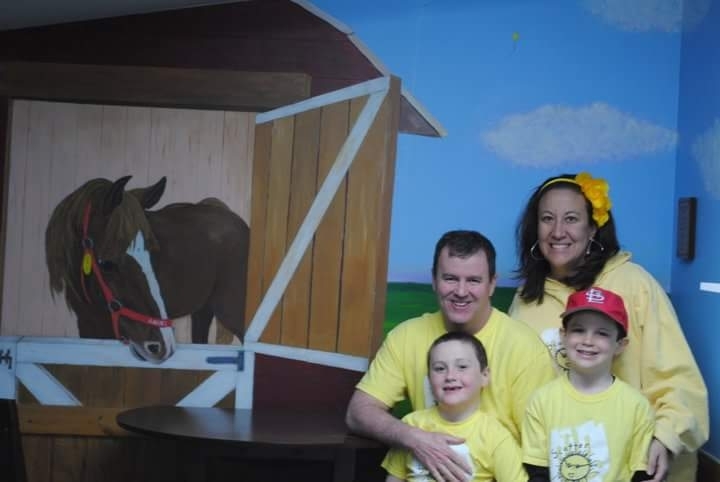 Children were able to have a pony ride, Adam and Drew cut a yellow ribbon as part of the dedication and a plaque was hung to dedicate the Family Room in Rachel’s memory.